← Short Run 2015: WHAT A SHOW! We think a lot about garbage here in Seattle. We’ve been ahead of the curve for many years. 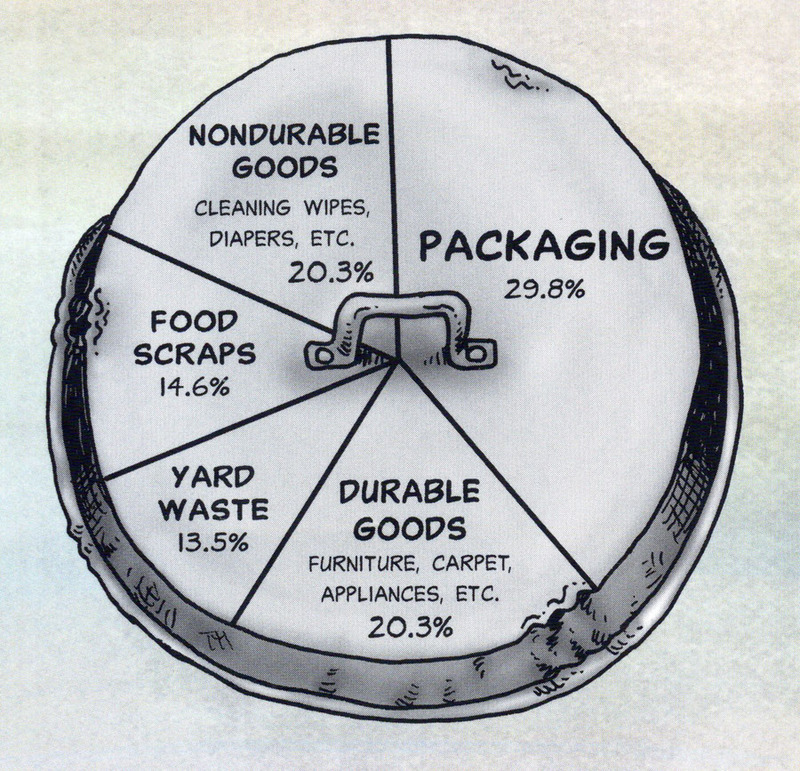 We separate our garbage from common garbage (non-food), compost (food), and recycling (very specific categories). I know that some Seattleites find utter joy in thoroughly washing their recyclables. And, lately, the City of Seattle has demanded more by showing no mercy and fining homeowners who dare to mix food in with their common everyday garbage! 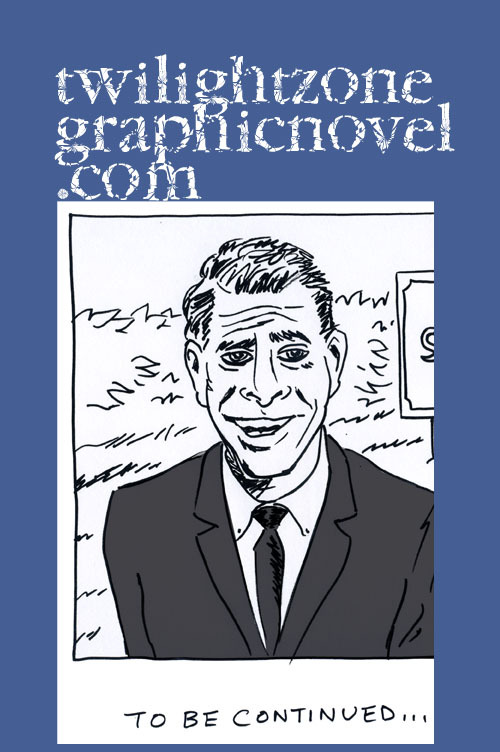 To read TRASHED, the new graphic novel by Derf Backderf, this whole business of garbage is not so complicated. The real solution would be to use less! But I get ahead of myself. In this book, you see the very human element to garbage from the viewpoint of a bunch of young guys just starting out in life…as garbage collectors. Derf Backderf has a style and tone to his storytelling that brings you right in. You might not necessarily want to be brought in to some of the content he’s involved with but, all the same, there you are. 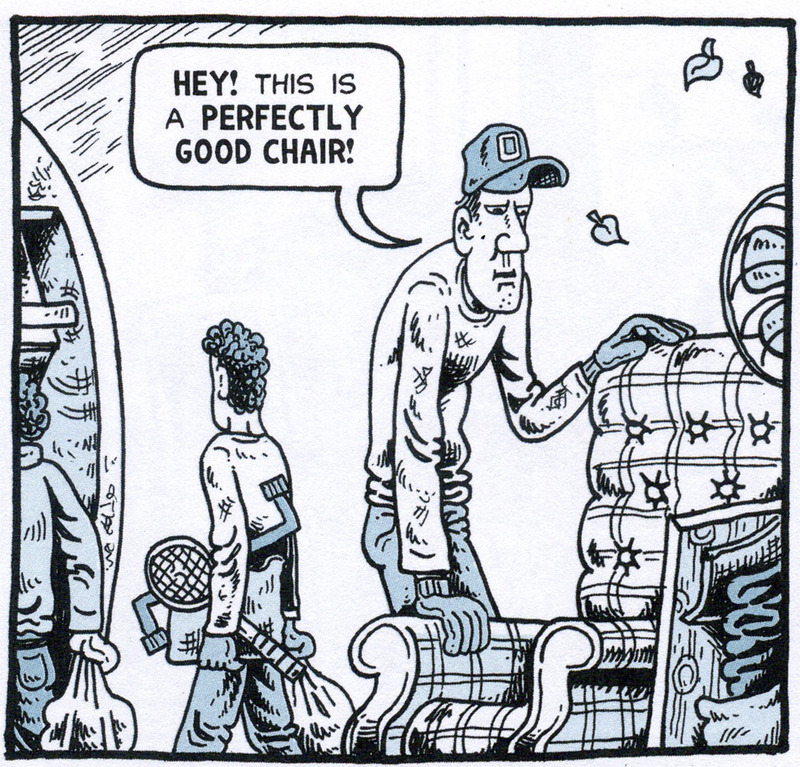 From his comic strip that examined Cleveland urban life to his previous recollections of Jeffrey Dahmer, Backderf presents the grim, the gritty, and the unvarnished truth. 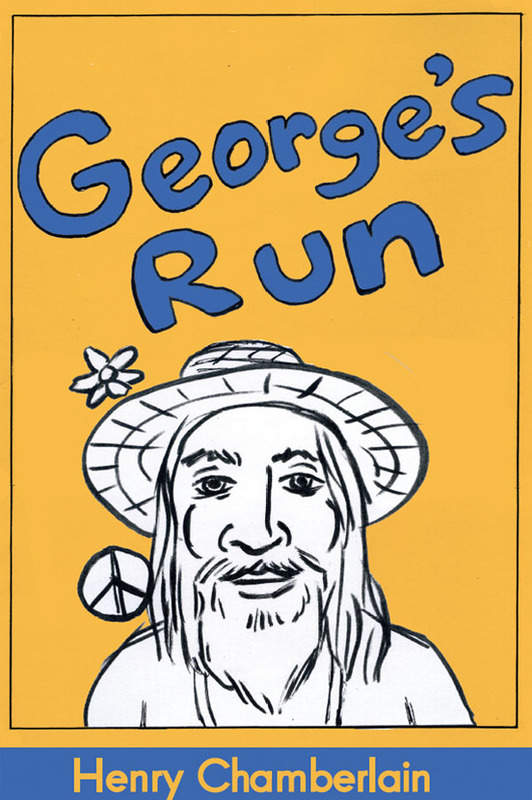 For his new graphic novel, he does something that may inspire other cartoonists to follow suit in their own way. He revisits some experiences from his youth and brings these old characters up to present day with contemporary commentary. 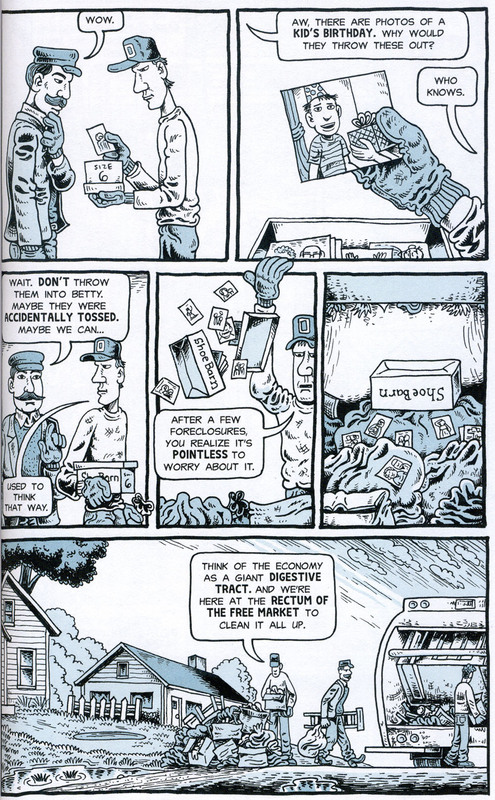 Backderf created comics based upon his year (1979-80) as a sanitation worker. In 2010, he took those old characters and, like ageless Archie comics characters, placed them in a present day setting for a webcomic. That project evolved into this current graphic novel. Backderf gently nudges along the idea that we’re all such disgusting slobs. Maybe not all of the time but no one gets completely away. And there are plenty of oddball characters that Backderf observes on his rounds who shouldn’t get away with anything like the unscrupulous dog catcher that terrorizes all the neighborhood pets. And then there’s all the people leaving out inappropriate items like a stove and a car engine block. Seriously? Yes, people have no shame. Knee-deep, and sometimes up to his eyeballs, in garbage, our main character prevails. He survives his year as a garbage collector. 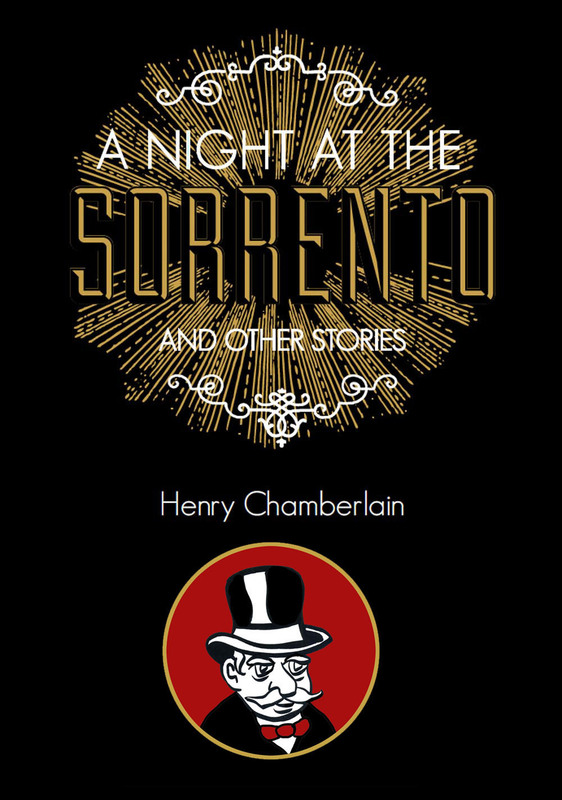 And, now, all these years later, we get the complete story in this funny, insightful, and beautifully rendered book. 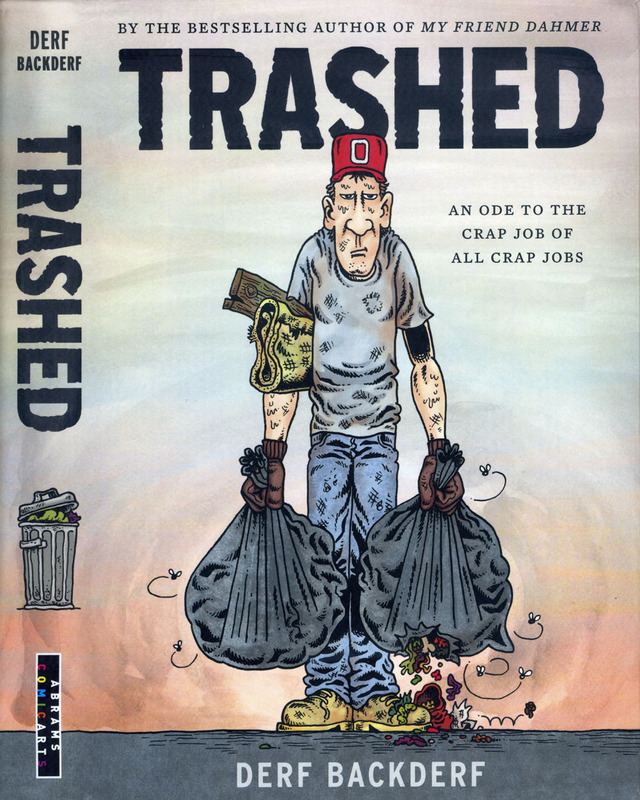 TRASHED is a 256-page hardcover, published by Abrams ComicArts, available as of November 3, 2015. You can find it at Amazon right here. Glad you shared that, Ashley. I should post about all the items, good stuff too, that is left at certain corners for our neighborhood to consider. Nice bookcases are a standard. Ooh, a bookcase would be great! Yeah, they pop up often enough. Nice chairs too. Sometimes tables. But it’s just wrong when people bring out their sofas.